Cubieboard6 was announced earlier this year with the same form factor as Cubieboard2 – which was popular a few years ago – by replacing Allwinner A20 with Actions Semi S500 quad core ARM Cortex A9 processor. 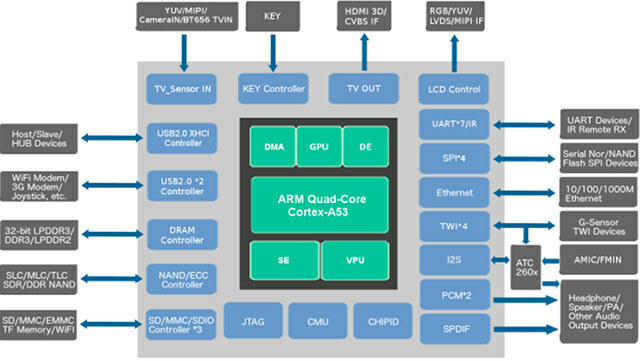 CubieTech is about to launch Cubieboard7 based on the same design, except for the processor upgrade to the pin-to-pin compatible Actions Semi S700 quad core ARM Cortex A53 processor. I’ve also found out Cubieboard2/6/7 can be connected to DVK522 expansion board to provide easier access more I/Os like LVDS, RGB LCD, VGA, and so on. SATA 3.0 port for 2.5″ HDD/SSD implemented via USB 3.0 switch and JMicron JMS578 USB 3.0 to SATA controller. Development resources like tools, Android 5.1 firmware and SDK, documentation, schematics (PDF) and datasheet are shared via a Baidu link. Usually they also provide a link to MEGA to ease download for people outside of China. The documentation appears to be in English, at least S700 datasheet and product brief which include the “application diagram” above. The processor actually supports Gigabit Ethernet, but they kept the Fast Ethernet connection in Cubieboard7 likely to avoid having to re-layout the PCB and increase costs. Right now, only Android 5.1.1 is available for the board, but the company intends to “continually maintain Android, Debian, Debian Server operating systems”. What also caught my eye with the board is DVK522 expansion board, that allows you to insert Cubieboard7 and older variants with the same form factor to more easily access various display and other interfaces, connect Arduino shields, etc… It’s been available since 2014, but I’ve only noticed it today. 1x ONE-WIRE interface to be used with 1-wire devices such as temperature sensor (DS18B20), electronic registration number (DS2401), etc. Cubieboard7 does not appear to be available yet, and pricing is unknown. For reference, Cubieboard6 is sold for 420 RMB ($62.33) on Taobao, and $98 on Amazon US, and we can expect the new board to sell for a few dollars more ($10 to $15 extra?). 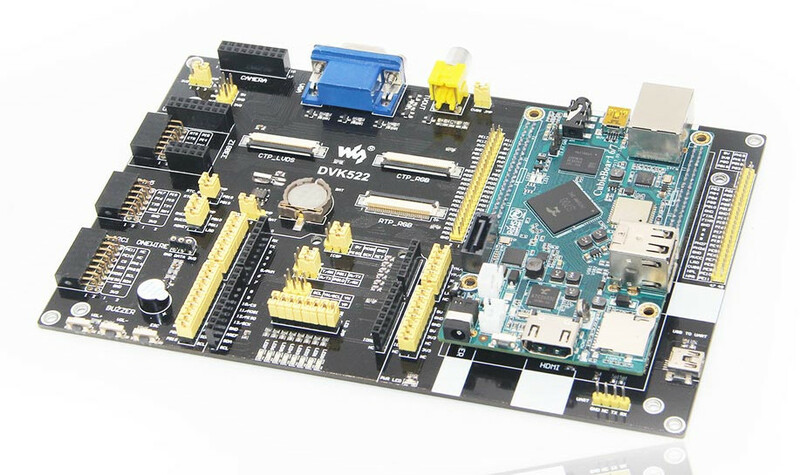 DVK522 expansion board has been designed by Waveshare, and sold on their website for $33.99. 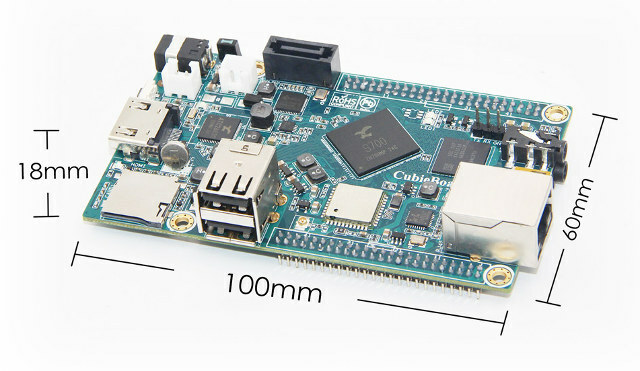 You may want to visit Cubieboard7 product page for a few more details about the development board itself. Thanks to Aleksey for the tip. I’m always amazed to see that vendors’ laziness drive them into saving one week of work to avoid changing 4 traces on a PCB resulting in a crippled design that doesn’t make an efficient use of the SoC they selected. When you have native SATA and GigE on the chip, you cannot reasonably sell a board limited to fast ethernet and expect it to succeed, especially when you’ve been selling cheaper and better designs for several years! Guys, don’t buy this and wait for the updated design which will properly provide GigE. Also, I couldn’t find any info on the CPU frequency on Actions Semi’s site. I’m seeing a new trend consisting in only communicating on the number of cores, but the reality is that a 2 GHz dual-core CPU will always be faster than a 1.2 GHz quad core. Since the A53 is provided in a wide frequency range, they should always indicate the target operating frequency. At 28nm we can expect something between 1.0 and 1.5 GHz I guess. Huh? SATA is provided by a JMS578 USB-to-SATA bridge connected to an ‘USB2.0 XHCI controller’ according to this ‘Application diagram’. This is where I stopped reading since… what to expect from ‘technical documentation’ then? Based on experiences with S500 software support and ‘quality’ of provided information/documentation two years ago this feels just like a huge waste of time. The block diagram may not have been properly updated, but S700 datasheet shows USB 3.0 is supported, and the schematics shows it’s using that USB 3.0 interface for SATA. Properly updated or not… XHCI is not and was never USB2.0. 🙂 If I see such stuff I already loose faith in the manufacturer’s ability to provide correct information. Too much time lost due to carelessness and ignorance. Just looked into my tests with S500 from a few months ago (Armbian forum, at the bottom of the ‘Some storage benchmarks on SBCs’ thread). At least with S500 UAS was possible eventually (back in 2015 Actions Semi engineers asked what that is according to LeMaker) but performance numbers look not that great (120 MB/s) especially compared to other USB3 implementations like RK3328 (~380 MB/s). Anyway: CB6 and CB7 with their USB3-to-SATA bridge chips show better performance than any older Cubieboard (those with real SATA included since ‘Allwinner SATA’ is slow SATA). So if people are happy with only Fast Ethernet and leaving the linux-sunxi comfort zone then these new boards might qualify as a more beefy and somewhat compatible upgrade. Adding an RTL8153 to an USB2 ports might even cure the low network bandwidth slightly. BTW: ‘leaving the linux-sunxi comfort zone’ was meant as a hint that for CB1/CB2/CB3 there exists superiour software and support situation due to open source communities. Starting with CB4 that has changed (Allwinner A80 still more or less useless with mainline kernel), the same with CB5 (Allwinner A83T) and it’s not different with Actions Semi SoCs on CB6 or CB7 now since there is no vibrant community around. What then happens is that you’ve to rely on vendor software/support offerings (same story with all those Banana Pi for example, first A20 based boards and their H3 board are supported by community, everything else only by vendor). Rule of thumb: If there’s no open source community around simply move along. Huh? SATA is provided by a JMS578 USB-to-SATA bridge connected to an ‘USB2.0 XHCI controller’ according to this ‘Application diagram’. ^still, your eyes aren’t open enough. because that lines means most probably a typo – there is no such a thing as USB 2.0 XHCI, they mistyped something – either “2” (vs. “3”) in “2.0” or “X” (vs “O” or “E”) in XHCI. what typo is more probable? > either “2” (vs. “3”) in “2.0” or “X” (vs “O” or “E”) in XHCI. what typo is more probable? No need for sample :). The only mistake is in the block diagram. All other documentation including the schematics, S700 product brief, and S700 datasheet point to USB 3.0 (XHCI). SDK and android image now available on MEGA, link not yet on the product page.